ETP fabricated pole vault pits and covers come in the 4 basic standard configurations. Here we deal with the International Standard Pole Vault Pits and covers. 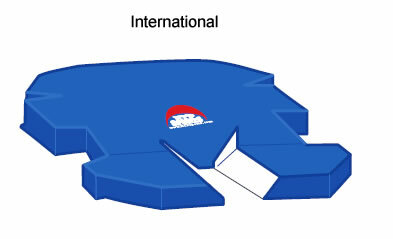 Use this page to contact us for a standard International Style pole vault pit cover. will hold its shape under all weather conditions. Base casings are interchangeable for even wear and long life. Select density polyurethane foam creates durability. Cross tunnel construction facilitates a smoother landing. Made of strong 2” webbing with reinforced stitching and an additional “X” stitching for incomparable strength. Heavy duty plastic zippers are corrosion resistant for smooth operation in all conditions. All zippers are sewn in to folded vinyl. Color Option: Blue (others available upon request). Side Release Buckles to connect pit pieces. Industrial grade hook and loop fastening system used for its sheer strength. **Fields Must Be Filled In.